When your son calls and asks, “How do you make salad dressing, Mom?” first, you melt, and then you get busy blogging. After all, wasn’t that the reason you started blogging, so your kids could have easy access to THE recipes with a few good Big Fat Italian stories thrown in for good measure? Salad dressing is a staple you might want to consider making from scratch. It’s easy to make and nice to have readily available, there are no preservatives or sugar in it, it doubles as a last-minute chicken, pork tenderloin, or steak marinade, and as long as you keep olive oil, red wine vinegar, garlic pepper, and salt in the cupboard you’ll never run out. Once you start making your own, it will become second nature to keep the vinaigrette bottle full. *I do not make this make-ahead vinaigrette with balsamic red wine vinegar. For some reason, the mixture turns syrupy when I do. I know not why. It doesn’t happen when I use white wine balsamic vinegar. Mix all ingredients together and shake. Store at room temperature. When measuring, I eyeball the vinegar and oil — one-third vinegar to two-thirds oil — and use a measuring spoon for the salt and garlic pepper. I’ve been making this salad dressing for 20 years. I had no idea my kids had noticed. The key ingredient is McCormick’s California Style Garlic Pepper with Red Bell and Black Pepper. I prefer garlic pepper to garlic salt because I have more control over the amount of salt since I can see the pepper to garlic ratio. You can’t say that about garlic salt. I also use garlic pepper in marinades, rubs, and as a prime seasoning ingredient for roasted vegetables. It’s how I push the easy button when making dinner day in and day out. True confession: I travel with it on vacations when I know I will be cooking. And, my favorite spring salad, the Lily Pulitzer Salad. During the summer, I use the marinade to make Lemony Grilled Chicken Breasts every time we have a crowd to feed for dinner. P.S. 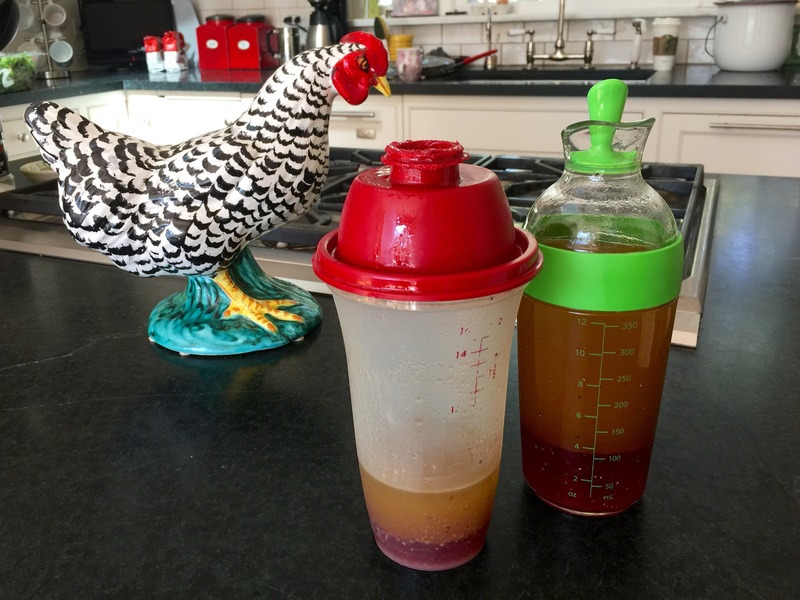 I have searched for years for a better drip-free salad dressing bottle than my 15-year-old Tupperware jar (on the left, in the first photo). I finally found one I like. It’s made by OXO. Never miss a post: sign up to become a follower of Judy’s Chickens. No, this is mine, although I learned about garlic pepper from Mom. Mom didn’t make her dressing ahead of time. She put the salt, garlic pepper and olive oil on the lettuce, tossed it, and just before bringing it to the table, added the vinegar. She often used the white balsamic, which is yummy. Thanks for writing about this. I guessed Evoo but I can see why garlic pepper is the staple. I use it on almost everything. That’s because we all learned from the same person, Mom! Beautiful photo – beautiful food! short and sweet. love it! Thank you, Mare! The last post could have been three posts! Oh, and it’s so so so yummy over green snap beans! Judy, I still have this recipe that you gave me. I love it on salad, too! Perfect recipe for a young man’s repertoire. Just sent it to my son! Guess what? I never make it, Quinn. I barely ever use it, but I’d love to make some to keep in the fridge for everyone else, so please tell me how you make it. Thanks! Also, I use garlic pepper all the time. I use it with olive oil to roast vegetables and as a marinade on chicken, meat and fish. Hope you enjoy. Judy PS blog about making mayo! Thanks for sharing your simple salad dressing recipe, Judy. It sounds delish & easy but I would never have figured out the garlic pepper ingredient! You are welcome, Susie. I add lemon slices to the dressing and use it as a marinade for chicken in a ziploc bag, too. Garlic pepper- i learned about it from my mother years ago. It’s Mary Strong from Chicago, part of the Eastern Surgical Society group. I cannot tell you how much I enjoy your blog. All of the recipes I have tried have been fantastic! Almost always, people ask for the recipes. I, of course, refer them to the blog. I also love how specific you are in your directions. I know this blog was in part started to help your kids learn to cook and to pass on family recipes, but I have benefited as well! I have passed the site on to my girls to learn from you too. In other words, your impact is not only appreciated but spreading! The various anecdotals you share are so informative. I especially liked the one you just posted about cranberries. So fun to learn and I admire your desire and ability to share the information. You are a teacher at heart. In addition to finally telling you all of that, I am writing today to say that I CANNOT find the McCormick’s Garlic Pepper that you describe. I have looked at 5 different grocery stores here in Chicago. I can find it on Amazon but have to buy a 12 oz (or maybe it was 20oz!) container, which is way more than this cook needs or wants in her cupboard. I am headed to Michigan this weekend and am going to look there. Any pointers if I come up short? Keep going on this fantastic blog, Judy. It is a good thing. Mary, this may be the most affirming letter I have ever received. Thank you. I read it out loud to Kelly. He was beaming. If my mother were alive I would have sent it to her. Thank you! Thanks, Joan! I can’t wait to hear what you have to say about them! I travel with garlic pepper and EVO! Hi, Susan. I store it in the cupboard. I make a new double batch about every ten days so it doesn’t have time to go bad. I think it would be good for at least 6 weeks and probably much longer. Thanks for signing up to follow my blog! !